The following project is a partnership with the Atlanta Downtown Improvement District. This project aims to improve community engagement by involving a younger demographic in downtown Atlanta’s Woodruff Park. Spark Corps is conducting Design Thinking Workshops with high school students. These workshop activities offer a variety of design methods that include sketching, prototyping, and testing of ideas. The deliverable of the Design Thinking workshops will be used by college students from Georgia State University to market and execute the final idea. Spark Corps has worked to develop this Design Thinking Workshop Package with all the curriculum materials necessary for facilitating and managing six design thinking sessions with high school students; each session building on the one before to create an iterative process that results in a final, refined concept. The Design Thinking Workshop includes a workbook created to document the project process through the Design Thinking stages; each step of the process has different engaging activities designed for high schoolers to encourage them to be creative problem solvers. The materials are versatile and can be tailored to any design project, while keeping the base information the same. Problem: How can we increase engagement of a younger demographic in Woodruff Park? Our workshops focus on the five main skills typically used in the Design Thinking process: Discovery, Ideation, Prototyping, Storytelling, and Presentation. Through learning these skills, students will adopt a Design Thinking mentality that can be applied to many projects they work on in the future. 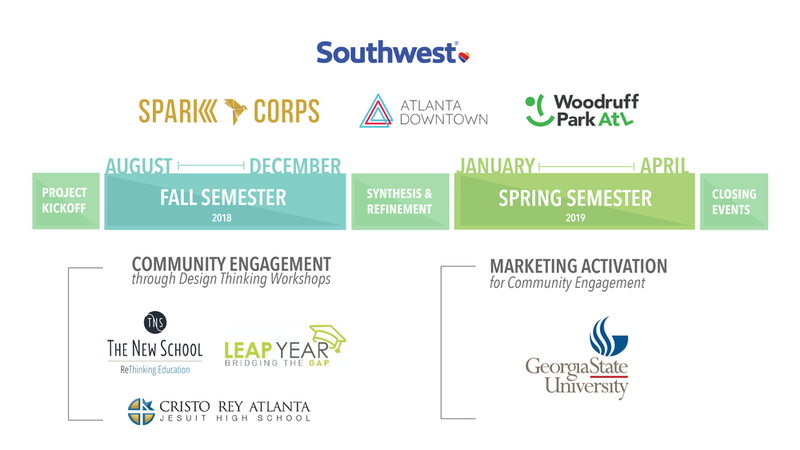 Students from The New School, Cristo Rey High School, and Leap Year fellows worked with Sparkcorps during six design thinking sessions to create solutions to increase younger demographic to Woodruff Park. The students learned the design thinking process and applied their knowledge to propose and present a solution. The Woodruff Park Pitch challenge contest was held on November 15, 2018, at Georgia State University Creative Media Building. Based on what they learned during the workshop the different teams pitched their ideas to a panel of judges and members of the organizations involved. The winning idea will be refined and produced by Spark Corps and our sister company Orange Sparkle Ball to help improve community engagement in Woodruff Park.